Household chores are an uphill task for most people. This is the number one reason why most individuals hire help, take their loads of laundry to the dry cleaners, eat out and even avoid moving out of their parents’ homes. Managing your own house and keeping it in good order shouldn’t be that hard even though our parents made a point of making it seem so. Simplymaid says with modern technologies and contemporary designs for our houses and household appliances, it is easier to reduce the pain of having to perform household chores by more than a half. All that is needed is a little bit of planning, patience, and discipline. Here are the five easy ways to lighten your domestic chores. Having a well thought out plan for your household chores is the first step to simplifying the whole situation. List and budget for any supplies you will need for all household chores, be it cleaning, cooking or simply having fun. It is usually so frustrating to start a task, only to have to stop in the middle because you lack important supplies or tools for work. The best approach to planning for domestic chores is first, planning the exact day for each main chore, and then subdividing the chores for each day according to the amount of time available. This way, you won’t waste time deciding what to do after every task as everything becomes more spontaneous and smoother. You will also be able to schedule your time, resources and energy efficiently. When it comes to floors especially, most of the dirt usually comes from the outdoors. By preventing entry of dirt into the house, you can reduce the amount of dirt on the floors and other household items by a great deal. For instance, placing doormats at entryways where people can wipe their feet before entering the house does help a great deal. If the space between your main door and your next door is long, you may make use of longer doormats that extend the amount of time anyone getting into your house steps on it thus reducing the amount of dirt stuck onto their shoes. As for high traffic areas, an area rug that can be shaken out when it gets dirty is a great addition. As for seats and upholstery, you can prevent dirt by training your hairy pets not to sit on them, and you may even get your children an alternative space to play. Other obvious precautionary measures include avoiding spills and messes from food, pets, and other household supplies. In case of such an accident, it is advisable that you clean it up immediately, even if it involves simply dabbing a piece of cloth to absorb the liquid. Having a robot to take care of some of your chores is a dream for most homeowners. While having a big advanced robot is an unachievable dream for many, getting a robotic vacuum cleaner is much like an everyday activity. A robotic vacuum cleaner does greatly change the standard of hygiene and cleanliness in your home as it lets you rest while it does the rest of the job. Robotic vacuum cleaners come with advanced technologies including navigation sensors, dirt detectors, auto-charging technology, strong suction and reliable filtration. These work hand in hand to ensure that your floors are left spotless, and the vacuum doesn’t bump into obstacles or fall off stairs and other edges. The Roomba and Neato robotic vacuum, for instance, are known for their great ability to be controlled remotely via a Wi-Fi connection. Through their respective smartphone apps, you no longer need to be at home to have them work. You can schedule cleaning, set up virtual boundaries and monitor the cleaning at the comfort of wherever you may be. Choosing the best vacuum among the countless models in the market may be tough, but if you plan to invest in any of these two, then the comparison between these robot vacuum cleaners you can find in this article. Whether they are your floors, laundry or utensils, regular cleaning does help a great deal in reducing your load. For instance, if you were to wash your clothes on a weekly basis, you won’t have as much load and trouble as you would if you decided to do your laundry once every month. This also applies to dishes. Loading the dishwasher and washing the utensils after every meal won’t hurt as much as it would if you were to wash dishes once per week. When it comes to floors, the best way to maintain a regular cleaning schedule without breaking a sweat is by investing in a high-quality robotic vacuum cleaner. You can schedule it to clean a couple of times every week particularly the high traffic areas, thus preventing dirt buildup, which is harmful in the end. If you notice a dirty spot on your tables, countertop, furniture, wall or any part of your home, it is best to wipe it off immediately rather than waiting for the next vacuuming session to take care of it. This way, your home will always be spotless, flawless and hygienic at all times. Keeping everything organized within your house will make it possible to see any dirt that crops up and take care of it. You have to declutter every room on a regular basis and keep the floors and other surfaces clear and open for better maneuverability and a fresher feel. Keep your clothes folded and stored away to prevent having to redo your laundry every time because you mixed up your clean and dirty clothes. As for utensils and culinary supplies, keep them arranged onto a rack or in kitchen cabinets to prevent unnecessary clutter. Any leftover food should be kept in the refrigerator, which should also be organized and cleaned regularly. When it comes to furniture, it won’t be of help to cramp everything in small spaces. Instead, keep what you need only and sell or gift the rest to allow for more clear and open floor space that cannot keep any clutter hidden. Organization of your house is a key factor to consider to avoid unwarranted clutter and dirt, which make cleaning chores more daunting. We all know that household chores are not a cup of tea for everyone. Even with the above tips for simplifying domestic tasks, if you still find it hard to perform these chores, then there is no shame in getting help. 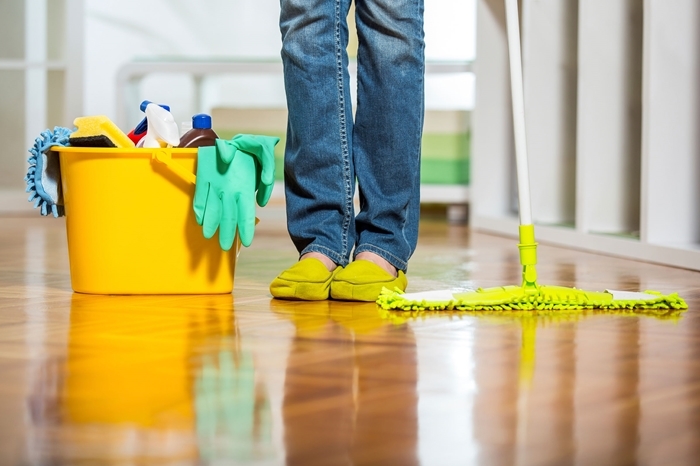 You can ask family and friends to help you clean the house, especially if you have very young kids who are fully dependent on you to take care of. If family and friends are not forthcoming, then why not enlist the services of a professional cleaner. After all, everyone will need them at least once yearly to come and deep clean their homes.